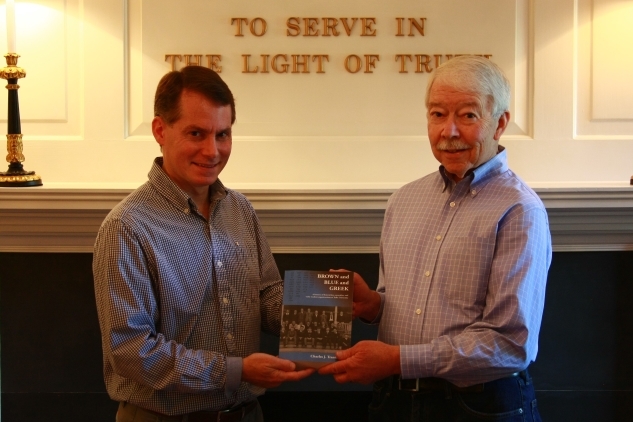 The Delta - v134n2 - Lost History - Sigma Nu Fraternity, Inc.
Charlie Trantanella (Tufts) presents his new book to Grand Historian Bob McCully (San Diego State). The Delta sat down with Charlie Trantanella (Tufts) to discuss his recently published book, Brown and Blue and Greek, is a history of fraternities and sororities at Tufts University. Back in 2010, I was poking around Tufts’ website. People were posting old pictures with just about everything. I stumbled across the digital library that Tufts had created—a website where they were scanning in their archives. I immediately went and looked for pictures of the old Sigma Nu chapter house. It was built in the 1870s and was a professor’s house for fifty years. I started looking around and next thing I knew, I found a picture of the Phi Sigma Kappa house. I thought that was strange because I never knew there was a Phi Kappa Sigma Chapter at Tufts. I found pictures of more and more fraternity houses that I never knew were fraternity houses, first of all, and from organizations I had never heard of. It didn’t take me long to realize that nobody had written about these student organizations at Tufts. I’d never written a book before, but I said, “Why not?” I just dove into it and … I really started to think, “There’s something more here. There’s stories worth telling.” Some groups are long gone and the alumni are no longer with us, but I tried to discover as much of Tufts history as I could—history that no one is really looking at or trying to document—and focus on the fraternities and sororities, and also, some of the early organizations back in the 1800s: some literary societies, some hazing societies, drinking clubs. Back in the 1870s, 1880s, class rivalries were very big. The freshmen came on campus and the sophomores considered it their job to haze the freshmen. They’d do all sorts of mean stuff: smoke them out of their rooms, tar and feather them in some extreme cases and just, you know, make them bow to sophomores. Eventually, it coalesced and some sophomores formed a Greek-lettered hazing society in charge of “educating the freshmen.” It would exist for a couple years, they’d do something stupid, and the administration would dissolve it. In the 1880s, fraternities were becoming very popular, so the sophomores threw some Greek letters onto these societies, called them hazing societies, and said they were very secretive, but the school put an end to them when things got out of hand. For good reason. I know some Tufts traditions started by [now dormant] fraternities are still going on. What are some of those? Every Spring, there’s a free concert on the lawn of the president’s house. They’ve had some great bands. I saw Stevie Ray Vaughan, Robert Cray, B.B. King. It’s an all-day concert. If you read through the official Tufts history, they say, “Spring Fling started in 1981. The school had some extra money and decided to throw this party.” That’s not true. In the 70s, Phi Sigma Kappa had turned into a co-ed group. They wanted to do a big concert for the campus. In ’76, they decided they were just going to do it. At the time, the drinking age was 18, so the big thing to get people to go was offer free beer. They did it for a couple years and then finally the school took it over. It was a very good concert, but they were not good about security. The school was not enjoying the whole “free beer” thing after a while. That eventually morphed into Spring Fling. The position of the school has been “No, we started it,” but it really came from this group of men and women who just wanted to do something fun. Did you find anything specific to Sigma Nu at all? How [the chapter] started was a very interesting story. There was a group of guys that lived together and they all were friends. They all got bids to different [fraternities] and decided they didn’t want to split up, so they were going to form their own. At the time, the school said, “You’re not allowed to form your own. We had too many problems during the Depression.” This was in the late ‘40s. “You’re not allowed to form your own fraternity at this point,” the trustees said. They found a loophole. “If we don’t form a new one, but restart an old one, then that would be okay,” so that’s the route they took. 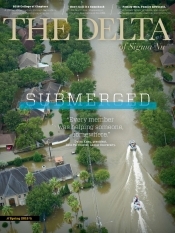 They restarted this local, Phi Delta, and a couple years later became the Sigma Nu chapter. How the chapter survived the ‘70s was interesting, too. Sigma Nu was down to two guys. Out of the two guys, one was a real introvert. The other guy was the extrovert. He went out and found a bunch of engineering students and convinced them to come live in the house. “We have a cook. We have some good food.” He convinced them to become Sigma Nu. They really embraced [Sigma Nu] and built it back up from essentially zero. Yeah. A few organizations didn’t survive. They were in similar circumstances, but for whatever reason, they went defunct. That Sigma Nu was able to reach that low point and turn it around is a fascinating story. If you had to sum up the book, what would you say? There were a number of books written about the history of Tufts and colleges in general, but a lot of those tend to be focused on the big picture – the administrators, the benefactors, the founder, prominent alumni who helped build things. I wanted to look at the students, because new students come in every year excited for college. What do they do with their four years on campus? That was my focus. Again, concentrated on the fraternities and the sororities because those organizations have been around since the school opened and they’ve done a lot of positive things for the campus. I think that their story was not really told. It’s been lost. The real structure of student life of the campus was built by the students themselves. A lot of that was through Greek life.